The Francis Winspear Centre for Music is expecting to break ground on its $54-million expansion this summer. The Francis Winspear Centre for Music is expecting to break ground on its $54-million expansion project this summer. 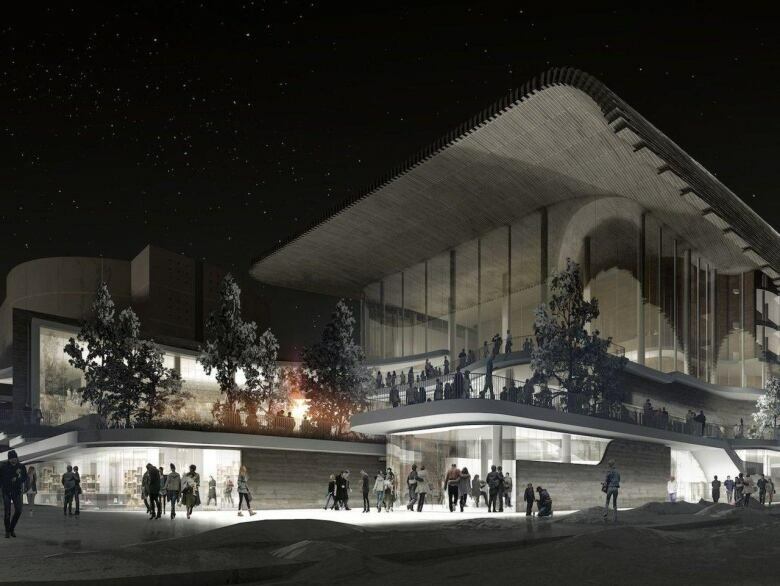 The downtown music venue, home to the Edmonton Symphony Orchestra, hopes to get funding from all three levels of government to cover $39 million of the total cost, Winspear CEO Annemarie Petrov said. Funding from the municipal and provincial governments has been secured, and the Winspear is currently "in conversation" with the federal government, Petrov said. The Winspear has to raise the other $15 million. Right now it is doing that through silent fundraising, and Petrov expects to open up fundraising efforts to the public in the fall. Petrov has been part of the expansion project since it started about seven years ago. "There are moments when I think, 'Wow, I can actually see it coming together,'" she said. "I cannot wait for the day that there's a ribbon-cutting ceremony." The centre, which opened in 1997, provides space for community events and programs. The expansion will include a smaller venue to seat 600 people. Instead of fixed seating, the new venue will have a hydraulic lift system allowing for changes, from a flat floor to raked seating. It could be used for concerts but also for other events, such as banquets. "That's really the jewel of the addition to the Winspear," said Petrov. The project will include some smaller multi-purpose rooms to be used for programs such as week-long school residencies. Schools would be able to use the rooms as classrooms while students are study curriculum "through the lens and sound of music," Petrov said. The expansion isn't the only new addition. The Winspear is working with Enmax and the city to build a district energy plant, which would be used to provide heat to some of the government and not-for-profit buildings adjacent to the building. That will cost about $19 million on top of the expansion, bringing the total cost of the project to $73 million. The project will expand the Winspear into an adjacent parking lot facing 97th Street. But parking shouldn't be an issue because the expansion will include underground parking spaces. Right now the parking lot can handle about 90 cars, and after construction there will be room for about 140 cars. Petrov said the construction has been carefully planned to avoid interruptions to programming. The centre will remain open through the construction period. A grand opening for the expansion is expected in 2022 — the year the Winspear will celebrate its 25th anniversary.